Something I pulled from the Idolm@ster Maid Cafe Website during Chihaya's Birthday. Chihaya-idol is so cute! I want this outfit to be the next DLC! I'll share my mash-up version of "Promise" which I made in late January, make sure to share this mash-up with your friends if you like it! I'm not sure if everyone can read this title properly, because it contains Japanese and Chinese characters. Ch: Haruka... what the hell are you singing... ? Ah yes, my OTP~ I like your mash-up by the way. Well done. Oh, and welcome to the forums! Thank you But I don't understand what is "OTP"
OTP means "One True Pairing", meaning the pairing (usually for shipping purposes) that you support the most. That's the way they always are, right? Pleased to meet you, too! Actually, they're fake because the character renders in Million Live do not emote at all. Lips move, but they don't emote. I had a feeling that was the case. I'll just delete the post then since I don't like fakes. Thanks, for letting me know. It's not necessarily a bad thing, that someone edited all these. People do that for all those Novem@s vids you see on NicoNico and stuff - the official art only has one facial expression, so they gotta draw on others if they want to show them making a bunch of different faces. Oh, I see. That makes sense then. I didn't mean to say that. Sorry, if that was implied. I’m not sure which topic to post this in. I wanted to post my reasons on why I love Chihaya here because I feel it fits better. The other topics are a little more general like who’s your favorite idol. But, for me Chihaya is my most favorite woman in the world (I wish I could marry her). So, I made a more in-depth analysis specific for her. Below are reasons why I’m completely in love with Chihaya. 1. She’s one of the original 765pro idols in a long-standing, popular franchise - So, she has a lot of history and is present in so many things especially the main games. And, she will stay relevant for a while. 2. She’s Beautiful – below I will break it down. a. Pretty – Not much I could say about this. She’s just pretty with long, blue hair. Look at her Million Live portrait and you will know what I mean. She’s also about 5 ft 3.75 inches, so that’s a good height. b. Mature look - I really love that mature look she has. And, it goes well with her since she also acts mature for her age. Again, see the Million Live portrait. c. Thin – Not much I could say about this. I just like thin characters. d. Very small breasts/flat chest –Miki did mention to Chihaya in one of the anime NOmakes that there are “crazy” people who prefer small breasts. So, I must be one of them. 3. She has a Mature, Interesting, Loving/Caring, and Awkwardly cute personality – She has so many dimensions. First, I would like to address Chihaya’s pre-developed personality. I believe she’s not very open about herself (given her past and parents that don't get along with each other and later divorce), but tries to be dedicated (to focus on singing and to become busy enough to forget remembering her past or dealing with parents). Of course, this comes at the expense of forming strong relationships (makes her seem unsociable) and seeing things in a different perspective, thus dampening her ability to become a top idol even though she works hard. She’s afraid (and distrusting) to make new relationships since she doesn’t want to share her past (or anything related to her family) with anyone except to a much smaller extent with Haruka. She’s still overall a nice person and highly respects her other co-idols since they are also working with her to become top idol. Over time, especially via the games you begin to slowly open her heart and help her overcome her past. Afterwards she changes, sees things in a different perspective, and becomes the real, happy Chihaya that everyone loves and admires. She’s becomes more of a life partner and shows her beautiful smile more often. a. Mature - Chihaya knows how to take care of herself at her age since she lives by herself. She’s also calm, nice, responsible, and hardworking, but can laugh and enjoy herself in different situations especially post development Chihaya. In the anime she enjoyed herself at the Christmas party. In the movie and manga, she enjoys playing in the beach with her co-idols. Also, in the games she enjoys your company and is very open towards you. In both the games and anime, she’s focus on idol work and keeps up with her idol training activities. Ami/Mami call her Chihaya onee-chan (even as far back as the 1st vision dramas) because she’s a good example for the younger co-idols (well Haruka is actually older). b. Interesting – Chihaya tends to ponder about many things. For example, in the games she reflects about herself, her actions/feelings, different places, other people such as Leon, what she seen, random topics, etc. It gives the story communications more depth. In the games, she’s sometimes a bit direct (outside of past or romance) and will ask/tell you whatever is on her mind or tell you what she wants or doesn’t like. She likes to express herself to you because she's comfortable being with you. Interestingly, her room is like mine in that it’s very plain. c. Loving/Caring – She often helps her co-idols whenever they are in need of help. In the anime she teaches Haruka how to sing properly and lets her stay overnight in her place. She also removes a leaf from Haruka’s head in the movie. So, she cares a lot for her friends. Chihaya also starts making up to her parents post-character development in the games and anime/movie as she is writing letters and calling them which shows she’s willing to keep bonds together. In the games you see a more loving side when she brushes your hair with her hands and helps tie your tie during a morning communication. When trying to act like a family she invites you to her home and serves you tea and attempts to bring you a newspaper. Also, she would take pictures of herself and send them to you. Even pictures of herself wearing pajamas. In the game and manga she’s worried if the producer is working too hard. In the games, she becomes attached to you, enjoys your company, and is very happy when you help her by touching her or relieved when you hug or pet her during certain communications. She also has a playful side. In one communication she lets the producer tickle her cheek to “wake” her up while they were in the car since Chihaya was sort of upset at him. There’s also one ending in the game where she strongly wishes to become a mother after seeing a mother walking with her child. There's also another ending where she agrees to live together with the Producer by saying they will find a nice house and she will do all the housework, which prompts the Producer to say that it will be fairer if they shared the housework since it'll be too much for one person. Again, there's another ending where she agrees to come with you to America after you return, and that night sends you a text expressing her love using play on words. Basically, in the games, Chihaya chose the producer as the one she wishes to share her life with. She wishes to be your life companion. d. Awkwardly cute – a very good trait that certain anime characters have since it makes them humorous and lovable. In the games and anime she occasionally overthinks about simple, trivial things, which comes off as pretty funny. For example, in the game and anime she has trouble buying a MP3 player since it seemed too complicated for her. 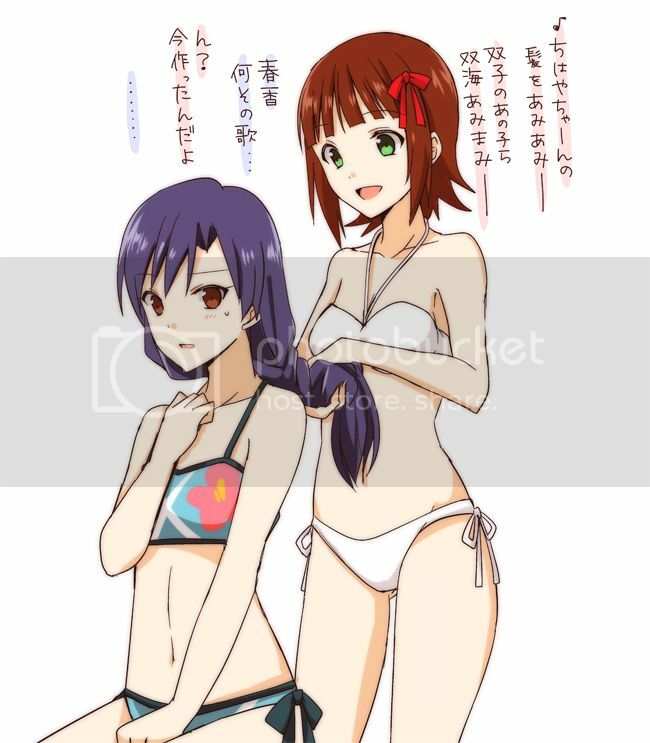 Chihaya definitely has an inferiority complex with her breasts and gets annoyed whenever she sees larger breasts characters Azusa, Takane, or Miki in the beach or bath. She also gets embarrassed very easily especially whenever she tries to act super cute or as a maid (as seen in the dramas). That’s why she sometimes tells the producer to forget what they seen or talked about. Chihaya is serious about work but looks very cute when she’s having trouble and turns to you for help like during her promotions. In the games, she blushes sometimes whenever she sends you texts with a picture of herself especially when wearing pajamas. She also laughs at odd jokes and dumb puns. In the anime and games she’ll laugh a long time whenever the producer makes a pun. Chihaya is often indirect when it comes to romance and gets easily embarrassed during the games and apologizes afterwards. In one communication she says that her heart beats fast whenever she’s close to you, but then quickly apologizes for saying that. Of course, we all know about her past (dead little brother and divorced parents). But, I think having such a deep emotional story and overcoming it with your helping hand is what makes you attached to her. By helping her overcome her past, you’re protecting her, taking care of her, and always keeping her in your thoughts. So, what makes her lovable is the relationship and bonding that’s built from this by having her trust/hold on to you as she struggles through, sharing the burden she holds with you, and giving her life back once more. You teach her how to enjoy life once again. She’s also attached to you as well since she later develops romantic feelings. So, she’ll return the favor back especially if you are going through a dark past. 5. She’s well Rounded - As Miki puts it in the manga; Chihaya can do anything. a. Loves music - She listens to songs and music, which is something I do as well. She might try to share her taste in songs/music with me. b. Tries her best but also has fun at the same time – Another quality I share with her. c. Idol – She’s an idol. I don’t need to say more. d. Sings – She has a beautiful voice and sounds amazing in many songs like fate of the world, arcadia, etc. Her voice has great variety since it has a great combination of cool, elegant, strong, and cute. Her other songs really reach deep inside your heart like nemurihime, yakusoku, saihyou, etc. She loves to practice singing, so she keeps up with her vocal training. e. Radio/Talk show host – Seen in Namassuka Sunday parts and in the mangas. f. Dances – She’s an idol after all and is pretty good at it since she keeps up with her dance training. g. Outfits – She looks beautiful in many outfits like her maid costume. I also like her simple but fashionable casual clothes. h. Cooks - In the anime she makes some noodle dish and later on an obento box for the picnic. In the game and manga she makes tea. i. Cleans – In the anime she does the dishes. j. Stays healthy – Chihaya and I are so similar in this aspect. In the games she often eats healthy and sometimes takes supplements, which are things I do as well. One of her hobbies is training (vocal, dance, physical), and I like to work-out myself. She is seen doing stretches, running, and sit-ups some of which can be seen in the anime, games, and dramas for idol activity and keeping her weight low. So, I’m sure she would find it enjoying if she could do these exercises with someone she likes. She might be impressed on how good I am. -Of course, we both like to indulge ourselves everyone now and then. In the game, she eats several servings of ice-cream at one time. k. Acting – She’s pretty good as in actress. In the game and manga, she participates in an action drama. In the anime and movie she stars in a yakuza/mafia? drama and Nemurihime, respectively. She even kicks Mami in the face. There’s a million live card where she performs hip wrestling against another ML idol and knocks her away into the swimming pool. m. Photography – she recently taken up this new hobby, and it fits her pretty well. This is seen in the games, manga, and movie. She is seen taking photos of sceneries, objects, and friends. She might even ask to take photos of me. That basically sums it up. Obviously, my love towards Chihaya is a combination of everything I mentioned. This was the result of years of researching her through the games, anime, dramas, skits, mangas, movie, pictures, etc. I apologize if my analysis of Chihaya is limited since I don’t know Japanese. It’s because of Chihaya that I’m still an Idolm@ster fan, and my wallet is screaming in pain. I used to have other female characters in other gaming franchises that I personally like. But, after years of being with Chihaya, I lost interest in them. Now, Chihaya is the only female character that I love or will ever love. Wow... looks like you've gone too deep for such relationship. If you want me to project a character on her (in family manner,) by age she's more like a younger sister to me, but mentally I am the younger and she is the elder. 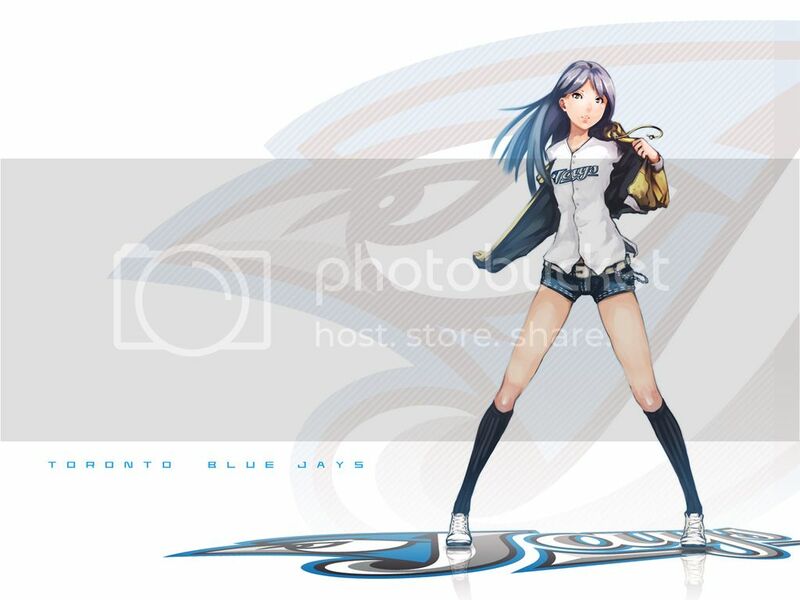 Anyway, here goes a combination of MLB with iM@S.
Chihaya vs Toronto Blue Jays! I have a question regarding Chihaya. For those who know Tv Tropes, would saying anything negative about Chihaya or her singing constitute being a Fandom Berserk Button? If so, how much of one do you think it would be? I'm thinking about adding it to the Tv Tropes page is why I'm asking this.